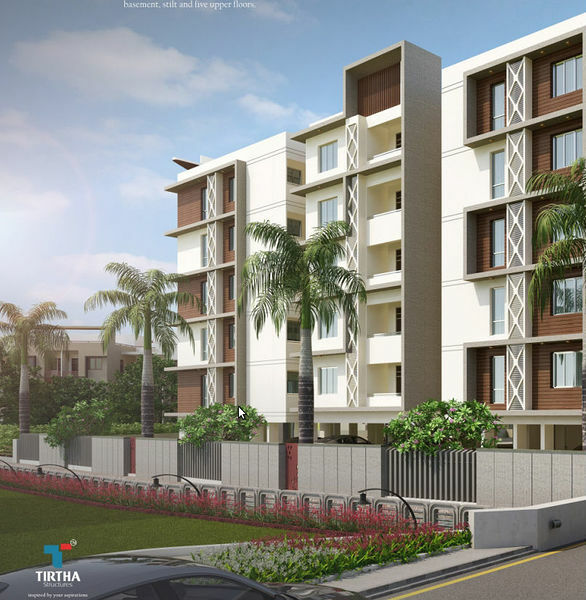 How Far is Tirtha Signature 1? Tirtha Signature introduces a new dimension in living space. An inspired architectural feat, this is a place that meets the demands of your lifestyle and provides you with the creativity you look for in a modern home. Around you the world unflods- the citys hub at the periphery of your dream environment. But this is just the tip of the iceberg. Brought to you by Tirtha Structures (India) Pvt Ltd, Tirtha's Signature lies midway between Shivrampally and the Agricultural University Campus gate, beyond Attapur. This Luxury gated community is located exactly abutting the 309th pillar of the PVNR Expressway, en route to the Rajiv Gandhi International Airport, Hyderabad. 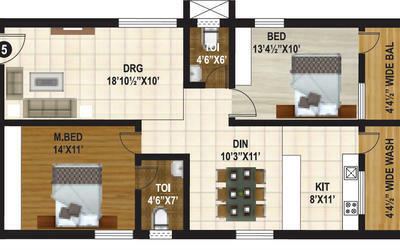 Hundered exclusive apartments are spread over two blocks, each consisting of a basement, stilt about five upper floors. 8" Light weight brick work for external walls and 4" Light weight brick work for internal walls. Or Red Brick work 9" for external walls and 41/2• inch for internal walls. Two coats of plastering and NCL. Alltek lappam finish. 2'X2' vitrified tiles of standard make in Living/Dining/Kithen and Bed Rooms. Acid Resistant Anti-skid Ceramic Tiles. Granite platform with stainless steel sink with both municipal and bore water connection and provision for fixing of Ague Guard. Glazed ceramic tiles dado opt 2'0" height above the kitchen platform. Provision for washing machine & wet area for washing utensils. glazed tiles upto 3'0" height. EWC wall mounted with integrated flush tank (cascade model) Hot & Cold wall mixer with shower, Provision for Geysers in all toilets. All C.P. Fittings or Jaguar or equivalent make. Multi strand concealed copper wiring of reputed brand. Power/outlets for Air conditioners for all bedrooms/drawing/living/dining. Power outlets for Geysers in all bathrooms. Power plug for cooking range chimney, refrigerator, microwave oven, mixer/grinder in kitchen. Power plug for T.V. D.G. set back up with Acoustic enclosure & A.M.F for common areas and 6 points in each flat. 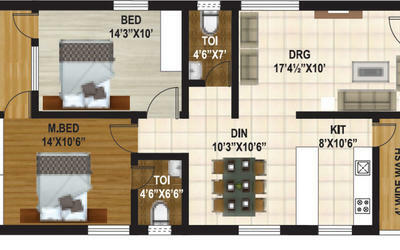 Provision for split A/C for All Bedrooms and Drawing, Living dining at extra cost. Telephone point in all Bedrooms and Living area, Intercom connectivity between flats and security. 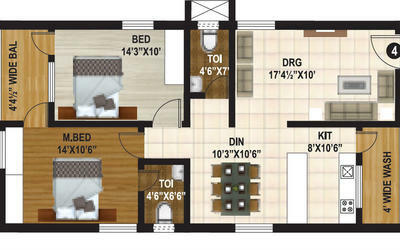 Provision for cable connection in all Bedrooms & Living area. One Internet provision for each flat with Cad 6 cabling. High speed automatic passenger lifts with rescue device with V3F for energy efficiency. Provision for Municipal water, water softening plant and Sewerage treatment plant are also proposed. Portable Fire Extinguishers at strategic locations. Emergency stair exits as per norms. Adequate security measures to be taken —CCTV monitoring of entry and exit points and intercom facility from guard room to each flat is provided. Tirtha Structures (India) Pvt. Ltd., a visionary group of construction experts who merge the best of Indian know how with state of the art international building technology. The Company began with the vision to transform the skyline of Hyderabad with exclusive residential buildings that pay tribute to the ultra modern way of life. Other ventures by Tirtha includes Tirtha 4 Seasons.